How am I supposed to write this review? 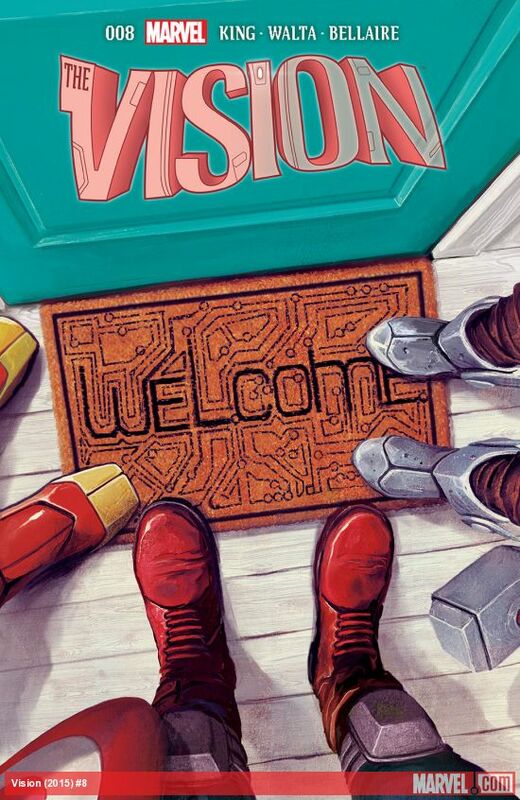 Vision is an incredible comic book, almost certainly the best series Marvel is currently publishing. It is such a strange, experimental book that, were it not for the familiar characters, you’d believe came from a much smaller and more daring company than Marvel. Vision #8 continues the amazing trend started by its predecessors. The first arc ended two issues ago, and its cliffhanger gave us the promise that the Avengers would be stepping in to find out exactly what was going on in the android suburban “utopia”. The next issue took a break from all that to give us a heartbreaking tribute to the romance between Vision and Scarlet Witch, and what became of it in the end. However, this issue brings us back to the main story line, and kicks off a new arc properly. A recurring theme throughout the series has been for the writers to take ordinary suburban experiences and tropes, and twist them into something far more creepy and grotesque. Take the Vision family’s dog, Sparky (a name chosen by fans, as it happens). An adorable pooch who shares their power of phasing through objects… made from the reanimated remains of a neighbor’s dog who died of electrocution after stumbling across the corpse buried in the Vision’s garden. This issue continues that trend with the introduction of Victor Mancha to the series. The book handily provides Victor’s backstory to the unaware: he’s another creation of Ultron, and was destined to one day destroy the world. 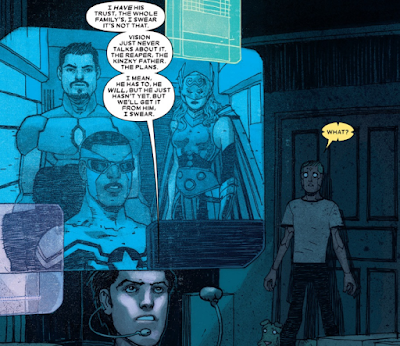 Vision also sees him as a brother, and invites him to stay with his family. So, it’s the typical ‘Uncle comes to visit’ storyline. 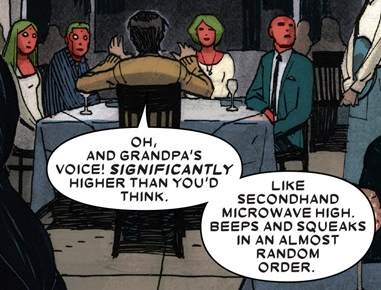 He tells hilarious jokes about Grandpa Ultron over a food free dinner. He has fun playing the piano badly with Virginia… until she begins to glitch again, a souvenir from the trauma of the past issues. He has a conversation with Vin about what vexes all teenage boys: an obsession with Shakespeare. When Viv visits the grave of her recently deceased friend Chris (who, unbeknownst to her, was killed partly as a result of her mother’s actions) and phases into the ground to see the corpse, he comforts her. 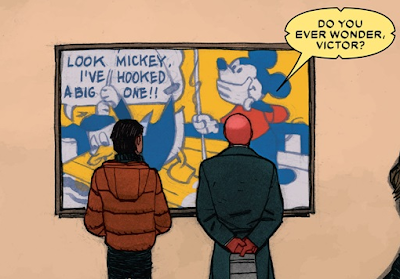 The dialogue is absolutely fantastic, and a scene where Vision and Victor talk about family at an art gallery is a highlight. Once again, I'm finding it tough to express how good this is. It's tightly plotted, suspenseful, creepy, and the art matches those themes beautifully. Seriously, just read it.